Fill each day in just your own way - maybe start off with a morning swim? How about enjoying the rest of your morning learning some fantastic new Archery or fencing skills? 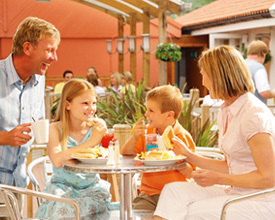 For lunch there are plenty of places out and about, or pop into the Cafe Bar & Grill. Come afternoon hit the Sports Court, explore Edinburgh, or relax with a game Tennis. To finish off a fantastic day, head off to the ShowBar for a drink, live music and dancing. 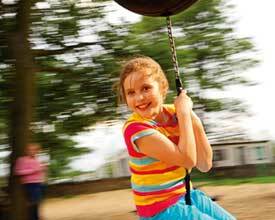 Whether out and about or staying on Park, you're sure to have a great holiday at Seton Sands. 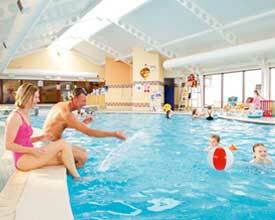 Seton Sands Holiday Village offers the following facilities. Only a 30 minute drive from historic Edinburgh you'll find yourself at one of Scotland's finest beach spots with Seton Sands. Edinburgh Old Town provides a huge variety of shops catering for every taste, from whisky to the occult, and from Highland Dress to Playing Cards. There are Galleries, Antique Shops, Crafts, Jewellery, Textiles, Cameras and Electrical Goods, Camping Equipment and Brushes. Whatever your taste, you will find somewhere to enjoy eating and drinking in the Old Town. For some of the most intriguing shops, the most enjoyable food and drink, you must explore the Grassmarket and the Bridges and look down the interesting side streets and closes. South of the park are North Berwick Boat trips, Scottish Seabird Centre and a 14th century fortress by the sea while not far way is Dirleton Castle now in ruins but well worth a visit. Gullane beach lies 15 miles away from Edinburgh on the coast of the Firth of Forth, and is popular with surfers, walkers, families and birdwatchers while the nearby village is a golfer's paradise, with three golf courses in the village and a further seven in the vicinity. 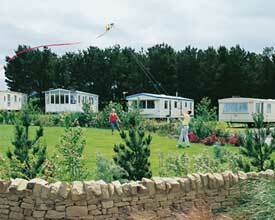 Have you been to Seton Sands Holiday Village? Please submit your review so that others can benefit from your experience. Important note: Information provided here about Seton Sands Holiday Village is based on our best knowledge. However, please check with Seton Sands Holiday Village before booking to ensure that you have the information required. Reviews are the sole views of the contributor and do not necessarily represent the views of CampsitesandCaravanParks.com or Seton Sands Holiday Village.